Coverflex Manufacturing is a leading manufacturer of Custom Removable Insulation Blanket systems for industries such as power generation, oil and gas, petrochemical, as well as marine and construction. Our insulation systems are a sustainable solution for insulating piping, flanges, valves, pumps, instrumentation, gas and steam turbines, generators, tanks, vessels, and exhaust systems. We meet the needs of our customers through design, fabrication, and installation services. Get the most from your industrial insulation systems by having them customized. Custom Removable Insulation Blankets are designed for an accurate fit to prevent heat loss, protect personnel from hot surface equipment and reduce sound. We use an array of flexible high-temperature fabrics, insulation fillers and fastening systems, which allow us to fabricate the insulation into different shapes and sizes. There are many terms used to identify flexible insulation. For example, insulation blankets, jackets, covers, pillows and mats. Our design engineers evaluate equipment’s specifications to produce the insulation system that will accommodate ambient and surface temperatures. After measurements are taken, drawings are made; your Custom Removable Insulation Blankets are fabricated and shipped to your company’s location. When it comes to insulating turbines, we have the solution. Our more traditional method for insulating turbines is our Double Layer Insulation System, which is just that: two layers applied in a staggered manner. By staggering the Insulation Blankets, any heat loss is absorbed and distributed. For an innovative approach to covering turbines, we have successfully designed a Single Layer System that has the same benefits as the traditional method but with added features. Our Single Layer Insulation System is designed with half of the Double Layer System. We achieved this by fabricating the system with an interlocking feature that mimics the staggering Double Layer System. The greatest benefit to the Single Layer System is the non-fibrous, heat-resistant material that minimizes airborne particles. 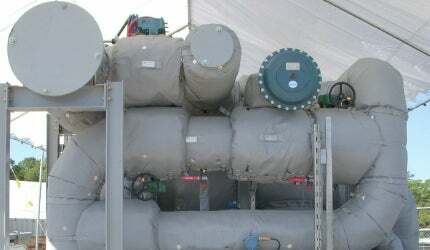 With our years of experience, we have fabricated many different types of Removable Insulation Blanket Systems. Heat Trace Blankets have built-in loops for attaching the cables to the blanket. Our Wall Seal Blankets features an accordian design to allow the Insulation Blanket to move with the turbine and still prevent heat loss. Leather Aluminum Welding Blankets are used to combat hot surfaces and protect against welding sparks. Acoustical Blankets absorb sound to reduce noise caused by loud machinery. Coverflex will provide conventional and flexible insulation systems. Removable Reusable Insulation Blankets are the best solution when it comes to equipment or machinery that requires routine maintenance, such as valves. Conventional insulation is a better solution for pipes that do not require as much maintenance. We provide professional installation services in addition to manufacturing. Our insulators have the knowledge and experienced to get the job done. Coveflex offers comprehensive scaffolding assembly for tasks with hard-to-reach applications. Your company’s needs are our top priority. Our professional team will design your insulation system, fabricate your blankets, remove the old system and install the new one. By listening to our customers’ wishes, we are designing new and innovative Removable Reusable Insulation Systems to better serve your industry. Contact us today with your specifications. We are here to meet your needs. Coverflex will be at this year's Thermal Insulation Association of Canada (TIAC) conference. Our number one priority is to meet the needs of our customers through innovative technology, design, fabrication, and installation services. A video demonstrating Coverflex's ability to provide wall seal insulation blankets for a range of industries. Coverflex will be attending the 58th Southwest Insulation Contractors Association (SWICA) annual conference. Coverflex will be at the National Insulation Association convention 2016.